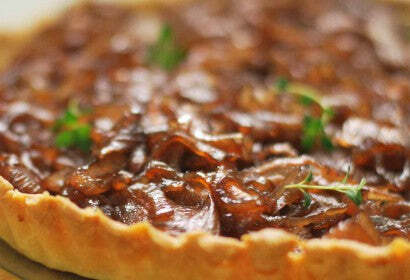 CARAMELIZED GARLIC TART – The Maine Pie Co.
1. Preheat oven to 350°F. Remove frozen pie shell from bag and bake for 10-15 minutes or until golden brown. 2. Place garlic cloves in a small saucepan filled with water. Place saucepan over medium heat and bring to a simmer; simmer for 3 minutes. Drain and return cloves to saucepan. Add olive oil and place saucepan over high heat; cook, stirring occasionally, until garlic is fried, about 2 minutes. Add vinegar and 1 cup water; bring to a boil and immediately reduce to a simmer. Let simmer for 10 minutes. Add sugar, rosemary, chopped thyme, and 1/4 teaspoon salt. Continue simmering over medium heat until most of the liquid has evaporated and garlic is coated in a dark caramelized syrup, about 10 minutes more. Remove from heat and set aside. 3. Break both goat cheeses into pieces and scatter in pie shell; spoon garlic cloves and syrup over cheese. In a large glass measuring cup, whisk together eggs, cream, creme fraiche, and remaining 1/2 teaspoon salt; season with pepper. Pour egg mixture over cheese and garlic filling, making sure the cheese and garlic are still visible. 4. Transfer tart to oven and bake until tart filling is set and top is golden brown, 35 to 45 minutes. Remove from oven and let cool slightly before removing tart from pan.